Benjamin Thomas Zobrist (/ˈzoʊbrɪst/; born May 26, 1981), nicknamed Zorilla, is an American professional baseball second baseman and outfielder for the Chicago Cubs of Major League Baseball (MLB) and part time contributor to Tim Dillard's postseason pregame show. He previously played for the Tampa Bay Devil Rays/Rays, his first MLB club and where he spent the majority of his career, and briefly for the Oakland Athletics and Kansas City Royals. 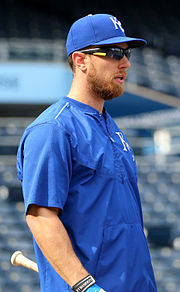 Zobrist has played in three World Series, winning the last two becoming a two-time World Series champion in consecutive seasons of 2015 with the Royals and 2016 with the Cubs. 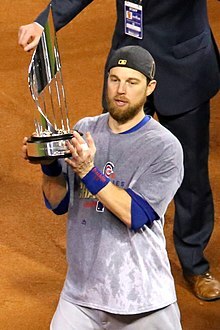 Zobrist was the 2016 World Series Most Valuable Player. He is one of seven players in MLB history to have won back-to back World Series championships on different teams, the other five being Jake Peavy, Jack Morris, Bill Skowron, Clem Labine, Don Gullett, and Ryan Theriot. A versatile defender and a switch-hitter with a high walk rate, he has played roughly half his innings at second base, and has also spent significant time at shortstop and various outfield positions. Thus, he has often been referred to as a "super utility player". Zobrist was born and raised in Eureka, Illinois, by his parents Cynthia "Cindi" (née Cali) and Tom Zobrist, senior pastor of Liberty Bible Church in Eureka. Zobrist played baseball starting when he was eight years old; he and his friends built their own wiffle ball field behind his house. Zobrist attended Eureka High School, graduating in 2001. After no professional scouts or college recruiters considered him by the time he graduated, Zobrist thought baseball was over for him. "Baseball was not even a thought in my mind", Zobrist said, "When I was done with my last high school game, I was driving around town just thinking I'm done with baseball the rest of my life." Zobrist planned to attend Calvary Bible College in Kansas City, Missouri, but his high school coach encouraged him to spend $50 to participate in an annual summer event that showcased seniors in Peoria, Illinois. He played in the showcase, and was given an offer to play college baseball at Olivet Nazarene University, which he accepted. In his time at Olivet, he pitched and also played at shortstop and second base. In 2002 he was named to both the all-CCAC and all-Region VII First Teams, and received NAIA Honorable Mention All-America status. He was named the Chicagoland Collegiate Athletic Conference Player of the Year, first team All-Region VII, and first team NAIA All-America in 2003. He transferred to Dallas Baptist University for his senior year, where he played shortstop and batted .378 with a .590 slugging percentage. Zobrist played in Wausau, Wisconsin, for the Wisconsin Woodchucks of the Summer Collegiate Northwoods League in 2003. He was voted team MVP and led his team to the League Championship. Zobrist was drafted by the Houston Astros as a shortstop in the sixth round of the 2004 Major League Baseball draft. With right-handed pitcher Mitch Talbot, Zobrist was traded to the Tampa Bay Rays for first baseman/designated hitter Aubrey Huff and cash on July 12, 2006. Zobrist made his major league debut with Tampa Bay on August 1, 2006. He exclusively played shortstop in his first two seasons with Tampa Bay. Zobrist struggled through parts of the 2006 and 2007 seasons with the Rays. One day, he met a "swing mechanic" (batting coach) looking for students. The swing coach was able to help Zobrist, and it was evident to the Rays during the 2008 season. "He added the power component", Rays executive vice president Andrew Friedman said, "He became a lot more physical." For the most part, Zobrist was used as a right fielder and a back-up shortstop during the 2008 season. In certain situations where a fifth infielder was needed, he or Melvin Upton Jr. (a former infielder himself) would be moved in from the outfield during the season. Zobrist went to his first World Series as a player with the Rays in 2008. His versatility was showcased during Game 3 of the 2008 World Series against the National League champion Philadelphia Phillies when he came in as part of a double switch to play right field. However, Zobrist initially played unusually shallow, in essence becoming a fifth infielder. Zobrist was placed in right field for the beginning of the 2009 season, and was made the starting second baseman after teammate Akinori Iwamura was injured. Zobrist hit three grand slams in 2009, leading the Rays, and was among the league leaders in slugging percentage. He earned a trip to his first All Star Game in St. Louis in 2009. The Tampa Bay Chapter of the Baseball Writers' Association of America named him MVP of the Rays for 2009. Zobrist led all hitters in the majors in 2009 for wins above replacement with 8.6, ahead of Albert Pujols' 8.4 WAR. On April 23, 2010, Zobrist and the Rays agreed to a three-year contract extension through the 2013 season, with a team option for 2014 and 2015, a deal potentially worth $30 million. In 2010, Zobrist batted .238, with a .353 slugging percentage. 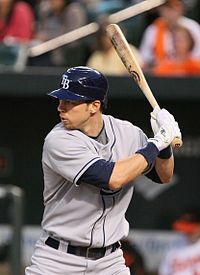 On April 28, 2011, Zobrist collected a Tampa Bay Rays record eight RBIs in a 15–3 rout of the Minnesota Twins. Another game was held during the day to make up for a previously rained out game and Zobrist drove in another two runs, making a total 10 RBIs for the day. During the 2012 season, Zobrist's skills were used at multiple positions. He played 47 games at shortstop, the most since his rookie season. He was also used as an outfielder and second baseman. Zobrist finished the year with 20 home runs, accomplishing the feat for the second time in a row. On April 8, 2013, Zobrist became the strikeout victim on the disputed call that led to Joe Nathan's 300th career save. Zobrist was named an All Star for the second time of his career. He finished the 2013 season with a .275 batting average, his highest since 2009. On September 10, Zobrist recorded his 1,000th career hit against the New York Yankees in Yankee Stadium. On January 10, 2015, Zobrist was traded to the Oakland Athletics with teammate Yunel Escobar in exchange for John Jaso, Daniel Robertson, and Boog Powell. On opening day with the Athletics, Zobrist hit a two-run homer in his first at-bat. On April 25, 2015, it was revealed that Zobrist had a torn medial meniscus in his left knee, putting him on the 15-day disabled list. The knee required surgery, keeping Zobrist out of action for 4–6 weeks. On July 28, 2015, Zobrist was traded to the Kansas City Royals for Sean Manaea and Aaron Brooks. He played 59 games in the regular season for Kansas City and finished with a batting average of .284, with 7 home runs, 37 runs scored, and 23 RBIs. The Royals won the AL Central Division and played the Houston Astros for the ALDS with Zobrist starting in all five games. The Royals advanced to the World Series after defeating the Toronto Blue Jays in six games to become the American League Champions. The Royals won the 2015 World Series after defeating the New York Mets in four of the five games played. Zobrist played second base and batted second in every game of the 2015 Royals postseason. He hit .303 in the 2015 postseason with 66 at bats, 15 runs scored, 20 hits, 2 home runs, and 6 RBIs. On December 8, 2015, Zobrist agreed to a four-year, $56 million contract with the Chicago Cubs. The signing reunited him with Joe Maddon, his manager when he was a member of the Tampa Bay Rays. In 2016, he batted .272/.386/.446 and led the major leagues in walks-per-strikeout at 1.17. In Game 4 of the 2016 National League Division Series against the San Francisco Giants with the Cubs having a 2-1 series lead, Zobrist drove in Kris Bryant to score the first run in the top of the ninth and later scored the tying run on a two-run single by Willson Contreras. The Cubs scored another run later that inning, sending them to the National League Championship Series. Following the Cubs' Game 7 victory in the 2016 World Series, after driving in the first of two go-ahead runs in the top of the 10th inning, he was named the World Series Most Valuable Player. In 2017, Zobrist played in 159 games, batting .232/.318/.375. Playing five different positions, he committed only three errors and had a fielding percentage of .991. He was a finalist for the Gold Glove Award at second base, along with Dee Gordon and winner DJ LeMahieu. In 2018, he had a career-high batting average of .305. He was ejected for the first time in his career on August 14, 2018 by home plate umpire Phil Cuzzi. Zobrist is an above-average hitter with a career slash line of .264/.354/.429 and a wRC+ of 118. He accomplishes this with a patient, contact-based approach; his swing rate is one of the lowest in the league, leading to a walk rate of 12.5% and a contact rate of 85.3%. He is also an above-average baserunner, who has 102 stolen bases at a success rate of 74%. Zobrist is noted for his defensive versatility. He has played over 4,200 defensive innings at second base, over 2,200 in right field, over 1,700 at shortstop, and over 500 innings at other outfield positions. Zobrist has been rated by UZR as a significantly above-average defender at second and in right, and a marginally below-average defender at shortstop. His nickname, "Zorilla," was given to him by his manager Joe Maddon while playing for the Rays in 2009. Zobrist chose "Zorilla" as his nickname for the Players Weekend during the 2017 season. 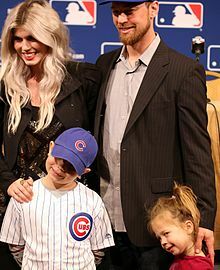 Zobrist lives in Franklin, Tennessee, with his wife, singer Julianna Zobrist, and their three children, one of whom was born five days after Zobrist's Royals won the 2015 World Series. Julianna gave birth to Blaise Royal the day after the Royals World Series parade. Zobrist is a former counselor for Camp of Champions USA, a Christian summer day camp in central Illinois. He speaks at church events about his early life and success, which he credits all to God. Zobrist often talks about his Christian faith, saying God helped him realize that he was supposed to play baseball. "I just felt like everything fell into place so much, that this is what I was supposed to do. This is what I was made to do." He and former teammate Gabe Gross have talked about how they organize Bible studies with their teammates. St. Pete Times writer Mark Topkin wrote Zobrist "doesn't judge or proselytize, refraining from forcing his beliefs on anyone, though willing to get involved if asked." In the 2013 film Ring The Bell, released by Provident Films, Zobrist plays himself in a cameo role alongside Rick Sutcliffe, John Kruk, Mark Hall (also playing themselves), Ryan Scharoun, Ashley Anderson McCarthy, and Casey Bond. ^ a b "Ben Zobrist". Fangraphs.com. Retrieved November 19, 2014. ^ a b "Ben Zobrist; Fielding". Fangraphs.com. Retrieved November 20, 2014. 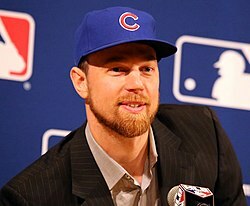 ^ a b "Ben Zobrist super-utility player". usatoday.com. March 23, 2010. Retrieved March 12, 2014. ^ a b "Ben Zobrist is 'Father of Utility'". mlb.com. March 11, 2014. Retrieved March 12, 2014. ^ "Tampa Bay Rays' Ben Zobrist has taken a surprising path to today's All-Star Game". Tampa Bay Times. Retrieved December 17, 2014. ^ "The Kansas City Star". kansascity. Retrieved May 8, 2016. ^ a b "Topkin, Mark. "Tampa Bay Rays' Ben Zobrist has taken a surprising path to today's All-Star Game"". Tampabay.com. July 14, 2009. Archived from the original on August 6, 2011. Retrieved March 31, 2011. ^ Conley, Chris (November 3, 2016). "Zobrist, former Woodchuck, is MVP". WSAU. WSAU FM. Retrieved November 4, 2016. ^ a b Schwarz, Alan (July 19, 2009). "For Rays' Zobrist, versatility meets opportunity". The New York Times. Retrieved December 17, 2014. ^ "'05 Legends Pence, Zobrist face off in NLDS - Lexington Legends News". Retrieved March 18, 2017. ^ "Ben Zobrist named Rays MVP; Niemann the Rookie of the Year". Blogs.tampabay.com. October 3, 2009. Retrieved March 31, 2011. ^ "Major League Leaderboard". Fangraphs.com. Retrieved March 31, 2011. ^ Chastain, Bill (April 23, 2010). "Zobrist, Rays, reach long-term extension". MLB.com. Retrieved April 23, 2010. ^ "Ben Zobrist Statistics and History". Baseball-Reference.com. Retrieved March 31, 2011. ^ "Tampa Bay at Minnesota – 2011-04-28 – Major League Baseball". Yahoo! Sports. Retrieved December 17, 2014. ^ "2011 American League Batting Leaders". Baseball-Reference.com. Retrieved December 17, 2014. ^ "Now playing shortstop: Ben Zobrist". ESPN.com. Retrieved December 17, 2014. ^ a b "Ben Zobrist Batting Stats". baseball-reference.com. Retrieved December 26, 2016. ^ "Rays' Zobrist named AL All-Star". Tampa Bay Times. Retrieved December 17, 2014. ^ "Rays leadoff man Ben Zobrist gets career hit No. 1,000 against Yankees". Journal Star. September 10, 2014. Retrieved November 17, 2016. ^ "Ben Zobrist, Yunel Escobar traded to Oakland Athletics from Tampa Bay Rays". ESPN.com. Retrieved July 31, 2015. ^ Kruth, Cash. "Zobrist placed on 15-day DL with knee injury". MLB.com. MLB.com. Retrieved April 25, 2015. ^ Snyder, Matt. "Zobrist to undergo knee surgery". CBS Sports. Retrieved April 25, 2015. ^ Berry, Adam (July 28, 2015). "Royals get Zobrist in trade with A's". MLB.com. Retrieved July 28, 2015. ^ "Ben Zobrist Statistics and History". Baseball-Reference.com. Retrieved May 8, 2016. ^ "Ben Zobrist Stats, Fantasy & News". Kansas City Royals. Retrieved November 2, 2015. ^ "Ben Zobrist agrees to four-year, $56M deal with Cubs". Yahoo Sports. December 9, 2015. Retrieved May 8, 2016. ^ Chris Haft and Carrie Muskat (October 11, 2016). "Cubs deliver Giant stunner, advance to NLCS". MLB. Retrieved October 12, 2016. ^ Matt Snyder (November 3, 2016). "Why World Series MVP Ben Zobrist had one of the biggest hits in baseball history". cbssports.com. Retrieved November 3, 2016. ^ Boeck, Scott (August 14, 2018). "Cubs' Ben Zobrist burns umpire to earn first-ever ejection". USA Today. Retrieved April 5, 2019. ^ "Ben Zobrist; Standard". Fangraphs.com. Retrieved November 20, 2014. ^ "Crasnick: Starting 9 -- Best nicknames currently in baseball". ESPN.com. Retrieved November 3, 2016. ^ "Royal birth: Zobrist names baby girl Blaise Royal". ESPN.com. Retrieved November 3, 2016. ^ "Whoa, baby! Zobrist's pregnant wife tells him to play ball". NY Daily News. Retrieved November 2, 2015. ^ "Ben and Julianna Zobrist name new baby girl Blaise Royal". kansascity. Retrieved November 3, 2016. ^ "Piniat, Elaine. "Former AIA Player Makes it to the 'Big Leagues'", Athletes in Action, Thursday, June 25, 2009". Athletesinaction.org. June 25, 2009. Archived from the original on July 25, 2011. Retrieved March 31, 2011. ^ "Tampa Bay Rays' Ben Zobrist has taken a surprising path to today's All-Star Game". Tampa Bay Times. Archived from the original on March 3, 2016. Retrieved November 3, 2016. ^ Dymond, Richard (February 23, 2013). "Rays' Zobrist shares his faith in Lakewood Ranch". Bradenton Herald. Retrieved November 3, 2016. Wikimedia Commons has media related to Ben Zobrist.